Ah I've missed writing on this blog! Hopefully I can be more present here in the months to come! I hope you all had a wonderful Thanksgiving and are getting excited and ready for Christmas. What a lovely time of year. Kyle and I decided to celebrate by making a 12 days of Christmas countdown. We each wrote six fun activities to do and put them in these little red envelopes to open one a day until Christmas. 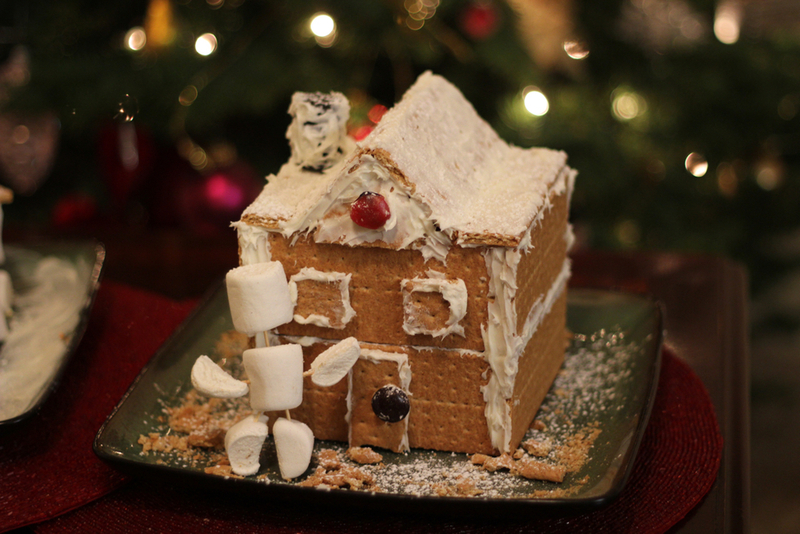 On the 12th day of Christmas, Kyle had written a note saying "Make a graham cracker/icing house." I then found out that he doesn't like gingerbread! We had fun creating listening to Christmas music and creating little masterpieces. I have NO idea how Kyle made his 2 stories. I could barely make a roof! But it was so much fun. On the 11th day of Christmas, I had written that we should make hot chocolate and drive around seeing Christmas lights. We found an awesome website that tells you addresses of the houses and neighborhoods that really get decked out for Christmas, so it was a blast. At the one house, a man that I think was the owner gave us candy canes with a list of songs that if we tune our radio to that station, the lights on his house blink in sync to the music! It was so upbeat and happy, and really got you in a Christmas mood! Hope you're finding little ways to enjoy the Christmas season with those you love!